Somerville Hall was founded by social liberals in 1879, in response to a growing demand to provide an Oxford education for women. It also offered a counter to the Anglican Lady Margaret Hall, which opened in the same year. Its founders named the Hall in honour of the Scottish mathematician and scientist Mary Somerville (1780 to 1872), and the Somerville family arms and motto (the notoriously untranslatable “Donec rursus impleat orbem”) were adopted. Over the years, the Somerville family presented the Hall with many family mementoes, a number of Mary’s own paintings and an important collection of personal and scientific papers (now in the Bodleian Library). The choice of name was significant. The College’s founders admired Mary Somerville both as a remarkable scholar and for her religious and political views. She was a self-taught science writer, wife, mother of five children, and polymath. In 1868, she was the first person to sign John Stuart Mill’s petition to Parliament in support of women’s suffrage. Having been denied formal educational opportunities herself, Somerville was a fervent advocate of access to education for other women. Mary Somerville published her first book, The Mechanism of the Heavens, in 1831. In 1834 she published her best-known book, On the Connection of the Physical Sciences, which brought the achievements of great contemporary scientists to the attention of a wider public. In 1835 she became one of the first women members of the Royal Astronomical Society, and in 1869, she was awarded the Victoria Medal of the Royal Geographical Society. All of this, when the very idea of women in science was widely frowned upon. Somerville Hall had its beginnings in the autumn of 1879 in Walton House. Its first Principal was Madeleine Shaw-Lefevre, sister of a Liberal MP, and daughter of Sir John Shaw Lefevre, a former Vice-Chancellor of London University. There were a mere twelve students, ranging in age between 17 and 36. According to Miss Shaw Lefevre’s diary “for the first few years two cows and a pig formed part of the establishment, but these were later replaced by a pony and a donkey which might be seen disporting themselves in the field, adding to the picturesque and homely character of the place”. Miss Shaw Lefevre envisaged her role as Principal lasting no more than a year. In fact, she remained ten years in post, presiding over Somerville Hall at a time when one of the greatest challenges was to convince the public that a college education was not actually harmful to women. Her major achievement was to surmount prejudice to women’s higher education, in both Oxford and the wider world. She was also largely responsible for “the wise establishment of precedents in the conduct of life in a women’s college”, according to her obituary in the Times Educational Supplement. Somerville’s second Principal, Agnes Maitland, came from a very different background, and had a very different character, to Madeleine Shaw Lefevre. During her principalship, the College grew in numbers from 35 to 86 students, consolidated its tutorial staff, raised the funds to build its own library, and established a research fellowship. In 1891 Somerville became the first of the women’s halls to adopt a qualifying exam for candidates. Three years later, in 1894, it became the first women’s hall to adopt the name of college, on the grounds that it would “not only improve the educational status of Somerville in the eyes of the public, but would be understood as implying the desire of Governing Body to raise it above the level of a hall of residence”. By consolidating its tutorial body, Somerville played a leading role in establishing regular conditions of employment in what was essentially a new profession for women. Agnes Maitland is duly commemorated by the building that bears her name, and by Somerville’s impressive Hall. Given that she worked so hard to raise the funds for its establishment, it is fitting that the first major building to be completed was the Library. Emily Penrose became Principal in 1907, the first of a distinguished line of homegrown principals. She had entered Somerville in her 30s and was the first woman to achieve first class in Greats. Emily Penrose staunchly believed that women should be admitted to university membership, and she was soon seen as the leading representative of the women’s colleges. Her 20-year period as principal had a profound impact on Somerville and Oxford alike. She was the first woman head of house to combine high administrative ability with high academic achievement, and committed herself fully to the struggle for recognition of women at Oxford. Her main objective was to raise academic standards, and she believed that women should aim at taking the full degree course even if a degree would not be conferred upon them. Emily Penrose was seen as a role model for the rising generation of women academics. Her principalship saw the consolidation of the teaching staff, and the status of tutors enhanced. Somerville was the first college to attract endowment for research. 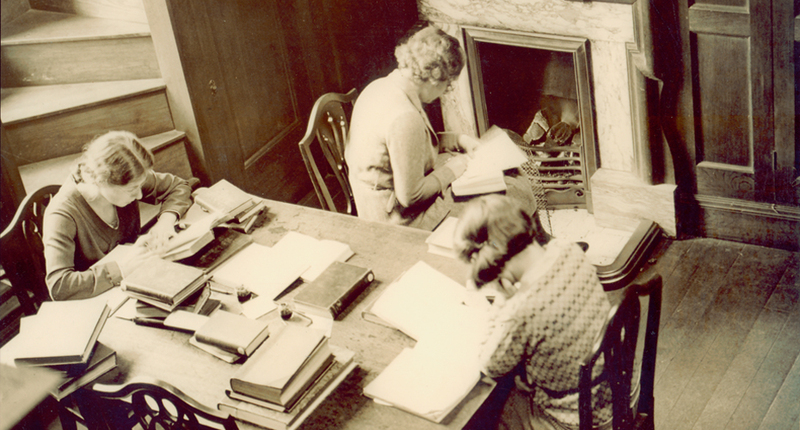 In 1920 the University of Oxford granted women the right to matriculation and to all degrees, as well as to membership of Convocation and Congregation, faculties and faculty boards. Somerville presented its first candidates for matriculation and for degrees in October of that year. Somerville alumna Helen Waddell, the Irish poet and playwright, told Penrose in 1925: “We feel it was you who made it inevitable that women should be recognised in the university”. In 1925 the College charter was granted, a fitting culmination to Miss Penrose’s Principalship. On retirement, she was awarded a DCL (Somerville’s first) and was later made a Dame of the Order of the British Empire. Emily Penrose’s successor was Margery Fry, who also had a long association with Somerville, as both undergraduate and librarian. Known chiefly as a crusader and social reformer, Margery Fry had been honorary secretary of the Howard League for Penal Reform since 1919. The Oxford Magazine welcomed the election of one “who combined intellectual distinction, a fine eloquence, and academic experience with the force of character and sympathy which the post demands”. Her energy, passion and commitment to social concerns signalled a new chapter in life at Somerville. She encouraged undergraduates to pursue interests outside their studies (encouraging the formation of a University Dance Club), and urged them to consider careers outside the traditional “eternal schoolmarming”. Margery Fry was Principal for just five years, but her principalship coincided with the 1929 Jubilee and the establishment of a Jubilee Gift Fund. Somervillians and friends of the College contributed £7,200, which was put towards appointing a tutor in Greats, books for the library and structural developments. Helen Darbishire, English Tutor at Somerville since 1908, was an unassuming Principal during a time of great unrest in the world at large, and a period of great change in Somerville. The 1930s were a time of hope and expansion for the College. Benefiting from a number of endowments (notably from Winifred Holtby), Somerville was able to finance major buildings works and the recruitment of some distinguished tutors. New recruits to the College staff saw the strength of the English school confirmed, and the appointment of Dorothy Crowfoot to a fellowship. Crowfoot won a Nobel Prize for Science under her married name of Dorothy Hodgkin. The challenges of leading Somerville through the post-war years fell to its new Principal, Dr (later Dame) Janet Vaughan, medical officer in charge of the North-West London blood supply depot for the Medical Research Council. She was the first scientist and the first married woman to be Principal of Somerville. She had graduated in natural sciences from Somerville in 1921, going on to become a leading haematologist, and in 1945 was one of the first scientists to enter Belsen. She remained a practising scientist throughout her time as Principal, publishing 48 papers in her 22 years in post. Dame Janet was a prominent figure in the university during this period, which finally saw the admission of the five women’s colleges to full colleges of the university (and saw the revision of Somerville’s charter and statutes in 1959 to reflect this). It was rare for a scientist to occupy the role of Head of House (at one stage Janet Vaughan was the only scientist Head of House), and she did much to raise the status and profile of science at Somerville. Within the university, she fought for the right of foreign students to bring wives and families to Oxford, campaigned for the provision of psychiatric care for students, and positioned Somerville at the outset of initiatives to establish a student health service. Another feature of her Principalship was the growth of the Middle Common Room. Numbers of graduate students coming to Somerville, many from overseas, rose steadily through the 1950s and 1960s. Margery Fry House was the first house for graduates to be planned in Oxford, and 14 nations were represented amongst its original 24 occupants. The college doubled in size in ten years, becoming home to 270 undergraduates and nearly 100 graduates, and major building developments had been undertaken to accommodate the growing numbers.. At the time Somerville was not only growing in numbers, it was growing in reputation. Somervillians were heads of all 5 women’s colleges, and Somerville had established a position at, or near the head of the Norrington Table. Barbara Craig, a Somerville classicist, who had spent nearly twenty years abroad assisting her husband in his work for the British Council, was the Principal during the late 1960s and 1970s, a time of student unrest and social change. Despite these unsettled times, Somerville arrived at its centenary in a position to reflect positively on its many hard-won achievements. The Somervillian Daphne Park, listed “Good talk and difficult places” amongst her hobbies in Who’s Who. As a diplomat (and, we now know, member of the intelligence services), she had been posted to Moscow, Leopoldville, Lusaka, Hanoi and Ulan Bator. In 1980 she became Principal of Somerville. She was a high-profile Principal whose external appointments included member of the British Library Board, Chairman of the Legal Aid Advisory Committee, Governor of the BBC, and Pro Vice-Chancellor of the University. She was keenly aware of the need for fund-raising to sustain a future for the College, and travelled internationally, raising funds in the hope of guaranteeing the financial security of the college. The great debate of whether to become a co-educational college formed the backdrop to the 1980s and early 1990s. Passions ran high on both sides. Finally, after much soul-searching the die was cast. During the Principalship of Catherine Pestell, (who became the first Principal to marry whilst in office, becoming Catherine Hughes), male Fellows were admitted in 1993, and male undergraduates in 1994. In the 1890s Somerville helped fashion the “New Woman”; a century later….the college has set itself the perhaps greater challenge of educating the “New Man”.